There are seven of us with this now and we've got a contest going to see who can win a round first (meaning survive to the end of a round in Solo mode). The winner will receive a free full-price game from his Steam wishlist bought by all the others. 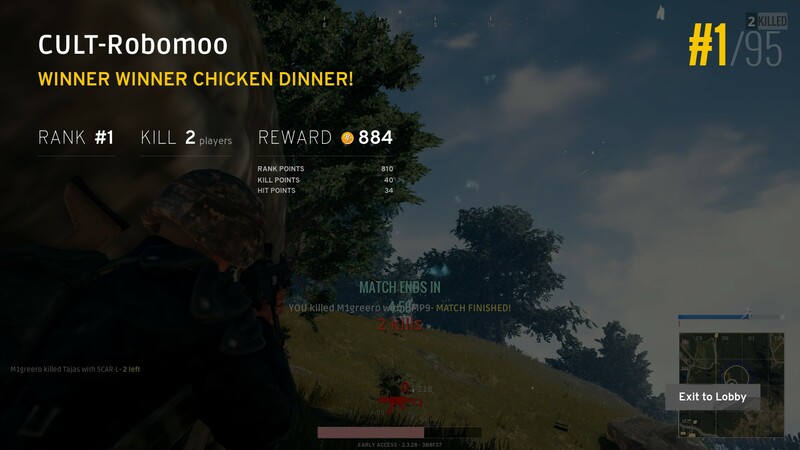 To win you must have video proof of the entire round, preferably by streaming it to the Cult Twitch channel, which means you must stream all your Solo gametime since you can never know in advance when you will win. So participants must have set up streaming, which can be done by talking to me about it on Discord. Whoever is interested, buy the game and come to Discord and talk to me about it. P.P.S. The console versions in the thread title don't exist yet, by the way. Also, make sure to name your character CULT-username, with the exact same username you use in the forum. If you mess this up you can still play with us and enter the contest, but it would be preferable to not mess it up because the devs are not allowing name changes currently (though they are saying they eventually will). A little late, but I felt a need to update this thread for the forum, Robomoo is our PUBG champion, claiming Ghost Recon Wildlands as his prize. The John McLane challenge is still up for grabs. Rules for the challenge are detailed below. Also, the John McLane challenge requires a video from start to end, preferably streamed on the channel, or at least recorded and uploaded to YouTube. It's not so much to check on people cheating as to enjoy the video for the rest of us, because this is the point of the challenge: to create an awesome action movie-like video that we can all watch and enjoy. However, we need to establish who's in the contest (and therefore who will foot the bill). So, post here if you are in. So far we got recoil and me.